Yesterday I blogged about the glorious side of our camping experience in Northern Arizona…. well, I purposely left out the Chuck information because I knew his story would require an entire blog entry. I’m kicking myself that we did not think to gather photo evidence of Chuck’s shenanigans for this unbiased report. How many campers can you count?? Chuck’s Info: Married; in the vicinity of 70 years old; Army-shaved-regulation hair cut; blue eyes behind wire-rimmed glasses; no smile; stern; fit; slight build; wears various National Camping Association issued tan shirts, shorts and hats which he changes intermittently throughout the day; Camp Host at Wet Beaver Creek; lives in a motor home; watches Who Wants to Be a Millionaire every day; drives a white golf cart counter-clockwise around the campground with various cleaning supplies standing neatly in the back; keeps an impeccably clean campground; is DILIGENT at enforcing the rules of the National Camping Association….. Extremely Diligent! We were not in the 13-site campground more than three minutes when we encountered Chuck and already had one infraction against us. We talked to another camper. That is not acceptable, as we found out. (???) We did arrive under unusual circumstances…. one wife, one husband, both married to other people who would be arriving later, two boys and a 35-year-old male friend….. with a truck and trailer full of enough camping paraphernalia to survive at least 27 days without human contact. We were in the midst of choosing two campsites when Chuck descended on us… seems we inadvertently drove past his site without stopping to introduce ourselves. We mentioned, mistakenly, that the kind camper lady across the road had informed us that she was leaving by 4:00 and we could have her adjacent campsite. Heaven forbid! That was a BIG no-no. No talking to other campers! Might cause a revolt???? We were then told that we could not occupy two sites without two vehicles…. what? Then the story changed…. was he trying to intimidate us??? Chuck informed us that we needed to indeed have all of our camping gear for both sites in our possession in order to claim and pay for two sites. We explained that we did… minus the second vehicle. (See the HUGE trailer FULL of camping gear?) We were then read rule number 353.7 from the Nat’l Camping Association handbook page 27 that there were only to be eight people maximum at each campsite and there were no exceptions. We kindly explained that we would have five unique individuals at campsite #11 and seven unique individuals at campsite #10. He assumed we were trying to pull one over on him. We look so devious! Good grief! How did he treat hippy looking, pot-smoking, tattooed, keg toting, loud music blaring reprobates? Each of us adults made it a point to make contact with Chuck for the purpose of gathering information for this report. We conspired to have him divulge nazi involvement or at least a military career. Nope, seems he owned gas stations, has a pace maker, wife had a heart attack two years ago but is OK now, lives in Mesa, has been camp hosting for seven years all over the nation, was retired for ten years before camp hosting and is at Wet Beaver Creek for three more months. If you go, you can’t miss him…. or more like it, he won’t miss seeing you! We decided that wherever Chuck is hosting we will stay. 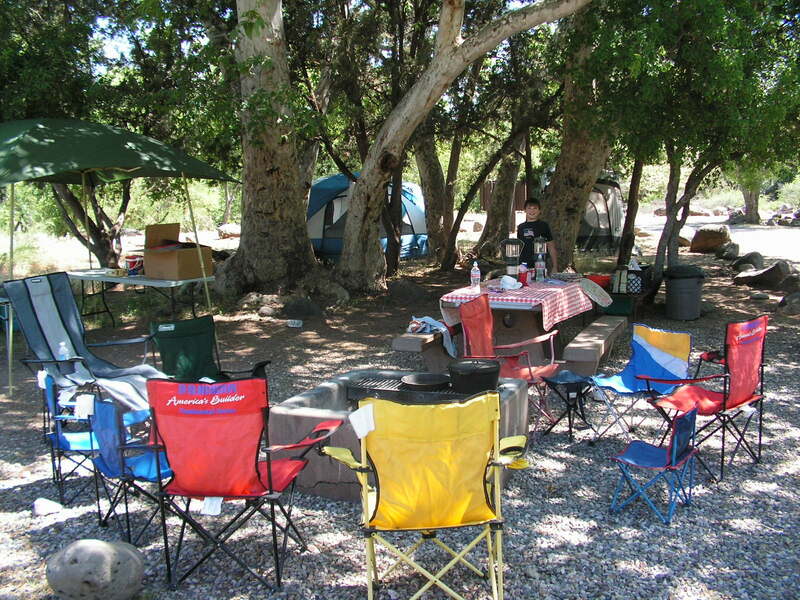 It will be a clean and orderly campground, albeit the feeling of Big Brother did permeate the camp.